We offer free quotations and specialist advice. For additional info call 01524 936 683 or 07776 267 159. T5 Inc. Ltd. are a well-established, respected business based in Lancashire working throughout the United Kingdom. We carry out Asphalt, Paving and Ground Works for commercial and residential customers throughout the country. 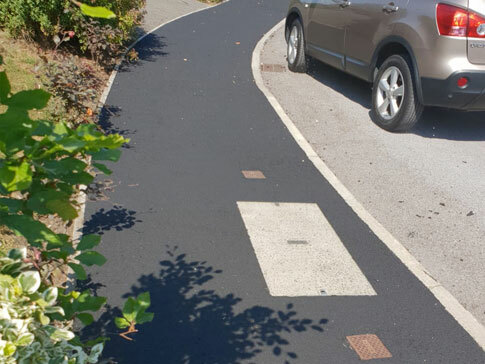 We offer a full range of groundworks and surfacing services including Asphalt Surfacing and Rejuvenation, Machine laid Tarmac, Micro Surfacing, Slurry Seal-Footpaths and Cycleways, Thermoplastic Road Markings, Groundworks including Block paving and Kerbing and Surface Dressing. 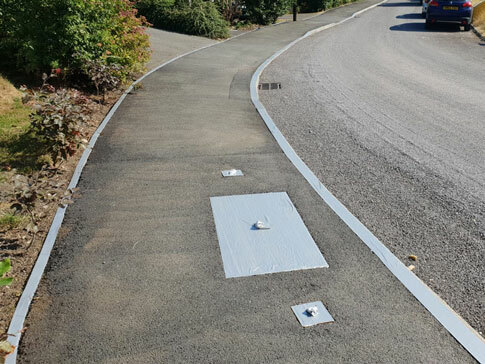 T5 Inc. Ltd. also offer a comprehensive range of treatments designed to extend the useful life of structurally sound footpaths, roads, private driveways, car parks and sports surfaces. Our extensive knowledge gained over many years in the Ground Works industry allows us to offer specialist advice to clients regarding cost effective, long lasting and high-quality solutions to all ground works and surfacing requirements. Most of our work is within the commercial sector, industrial sites and sports clubs but we also offer our expertise to domestic customers and private clients. Scotsman John MacAdam is credited with creating tarmac but the product which MacAdam created was simply a road surface of compressed, crushed stone but with no binding agent, so the crushed stone was loose, and roads would become rutted and even impassable. In 1901, Nottinghamshire county surveyor Edgar Hooley discovered a solution. He was walking along a road, which had been surfaced using the MacAdam’s crushed stone process when he noticed a smooth section. He asked some local people about the surface and was told that a barrel of tar had fallen from a cart and burst open. Slag from a nearby furnace had been poured onto it to cover the sticky tar and a basic version of the tarmac process was born. In 1903 Edgar Purnell Hooley registered Tarmac, as a trade mark, and formed tar Macadam Syndicate Ltd but he proved to be a poor businessman and struggled to sell the product. Soon after, the Tarmac company was bought by steelworks owner, Sir Alfred Hickman MP, whose factory produced large quantities of slag necessary for tarmac production. Sir Alfred Hickman re-launched the Tarmac company in 1905 and it became an immediate success and still remains as the brand leader, to this day. Tarmac or to give it its full name tarmacadam is made from crushed stone coated with bitumen. It creates a strong durable surface and with the addition of a finer grade top coat offers improved water resistance and grip, as well as creating a texture which gives the material an aesthetic quality. Tarmac has a major drawback in that it is easily damaged by petrol and diesel spills and today, tarmac has been replaced almost by Bitmac. Asphalt is made by combining a blend of aggregates with bitumen to bond them together, although the major difference between this and bitmac is that bitmac contains much more sand and filler. Asphalt concrete surfaces mix asphaltic cement with finer aggregates such as sand or grit. These surfaces can last much longer than regular asphalt driveways, but they come at a much higher cost, require much trickier repairs, and they are far more susceptible to damage from temperature fluctuations. When the term asphalt driveway is used it may be referring to one comprised of asphalt concrete, which is an entirely different type of surface. Asphalt is the preferred option when used over a large area, hence why it is often used for road surfaces, but for a small surface it can be an expensive option. Asphalt is much harder wearing than bitmac or tarmac, but at the cost of being less resistant to scuffing from car tyres. However, asphalt is not as affected by extreme weather as much as tarmac and requires less maintenance over time. Contact us today if you require professional surfacing services in and around the Lancashire area. You can reach out to us by calling 01524 936 683 or 07776 267 159 or sending an email to enquiries@t5contractors.co.uk. We are proud to offer a hassle-free service in which prompt attention, delivery on time, to your complete satisfaction and taking extreme care to carry out your work to the best of our ability is at the forefront of what we do. Asphalt, paving and groundworks services.